Here we have a battle of crossovers: the first — a subcompact utility that tries its best to be a luxurious offering — is the Buick Encore. The second is somewhat of a tweener, as it straddles the midsize and compact vehicle segments and does its best to appeal to everyone in the market for a crossover. We’re, of course, referring to the Chevy Equinox. So, which one would you (or did you) buy? Vote in our poll below, and then tell us the reason for your decision in the comments below. I’d go with the Chevy because of the pissant engine in the Buick. equinox, because if I wanted a Sonic 5 I would just buy one. When the new equinox came out I thought they offered 10 airbags? The Chevy equinox’s shape and design has seasoned well, it’s still a great vehicle. I hear the news that they are putting it on a smaller platform and I wish they kept it that size, and I like the captiva where it’s at.. But for the encore the 1.6 should be offered when it comes out.. 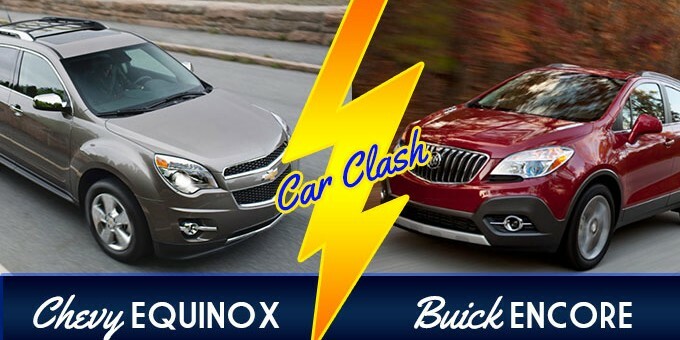 I like both but I do like the equinox..
Buick less space but easier for some to drive and more MPG. Nox has more room less MPG and is a little more difficult for some to drive. I own a Terrain and spend a lot of time on a Theta forum and I see first hand they are made to appeal to two different people. I also own a HHR and I think the HHR people would feel more at home in a Encore and would enjoy the refinement, Most on their forum have said they would have been happy to pay more for a better interior. I’d take the Buick because size here is not important to me. The features and economy plus mileage and warranty make it worth having in my opinion. Relative to the Encore, I now drive a car that has 10% more horsepower, has a more efficient transmission, has better aerodynamics, and is several hundred pounds lighter. I find my car to be only marginal in terms of acceleration on crowded freeways, even when the engine is in its power band. But, I’m optimistic. By the time I’m ready to purchase again I think the Encore will have been improved by getting this sort of feedback from owners. Might even by then come with a suitable armrest. We bought the Equinox because of back seat space and trunk space. We needed comfortable space for 4 adults. These 2 vehicles should not compete against each other as they are in different size catagories. If the Equinox were the same size as the Encore I would have had to shop elsewhere. Otherwise we like both vehicles. I have a 2009 Equinox, and if I had to replace it, I will get another Equinox. I bought it without reading about it, and for me it is a hidden gem in Chevy’s line because I have never seen any ads or promotions on the Equinox. GM built several Fuel Cell powered 2008 Equinox, so it was the very first CUV to actually have an electric powertrain on the road. Unfortunately for us, GM never followed through. We would had a BEV Equinox by now, in addition to the EREV Volt and the 2014 Spark BEV. We all need to consider the Encore is a new segment for the market not just GM. There is nothing else out there like it and many are watching to see how this one reacts. There are some similar in size but they are not in the comfort class this one is in. A more significant comparison would be Buick Encore vs. Chevy Trax (Tracker in some markets). The Chevvy has better power seats, especially for the front passenger. I just picked up a ’13 AWD version for $24,000 and am seeing right under 40 mpg while cruising on the highway at 60 mpg. With only 100 miles on the odometer it should loosen up a bit during break-in. There is no gasoline, awd vehicle sold that see consistently in the 30 mpg range, regardless of drivetrain, than the Encore. The BuickForums the results are similar 30+ mpg in mixed driving. I took my first off highway ramp sweeper and was shocked just how composed and responsive it was especially when I trail-braked for the turn at the end. Truely a fun, quick ride once up to speed. Though not as quiet as my Turbo Verano, not even the Lacrosse is either, it is very good chassis dynamics and noise control. Most public has the stodgey image of Buick images of yore but I would not have purchased two if they did not perform. You have to drive them against the bigger competitors to see this small package performs. And it is not really that small at about 65 cubic feet of storage with the front passenger seat folded down.